HACE 40 AÑOS: SAMMY HAGAR SE EXPONE A LOS FANS DE KISS. 40 Years Ago: Sammy Hagar Exposes Himself to Kiss Fans. KATEY SAGAL SE INCLUYE ENTRE LAS CONQUISTAS DE GENE EN UN NUEVO LIBRO DE INTIMIDADES. Katey Sagal counts herself among Gene Simmons’ conquests in new tell-all. PAUL STANLEY DESCARTA UNA REUNIÓN CON LA FORMACIÓN ORIGINAL DE KISS: “No tengo intenciones de revisitar el pasado”. PAUL STANLEY Rules Out Original KISS Reunion: ‘I Have No Thoughts Of Revisiting The Past’. Guiño a Kiss en la premiada “Que Dios nos perdone” de Rodrigo Sorogoyen. Wink to Kiss on the awarded film “Que Dios nos bendiga” by Rodrigo Sorogoyen. ACE añade un cuarto show en Argentina. ¡KISS actuará en el Grand Casino Hinckley Amphitheater de Hinkley, MN el 15 de Julio de 2017! MIRA EL VIDEO-CLIP NUNCA ANTES VISTO DE “I”. Watch Kiss’ Previously Unseen Video for “I”. VIAJA A GLASGOW (ESCOCIA) CON KISS ARMY SPAIN PARA VER A KISS. PAUL STANLEY PUSO EN SU FACEBOOK: “¡Me siento bien! 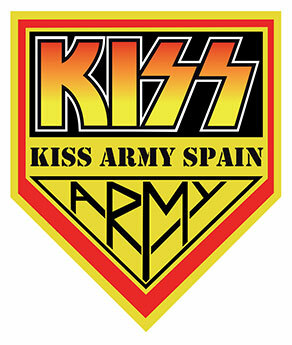 VIAJA A LONDRES (UK) CON KISS ARMY SPAIN PARA VER A KISS! !